Unlike almost all impulse shopping at big box stores, the Netgear WN3000RP proved to be singularly capable, and worthy of five stars in the above ratings grid. Nicely made, preposterously easy to set up and serene if you happen to notice it at work, it solved in five minutes that which had hitherto crouched, eldritch and brooding, for several months. 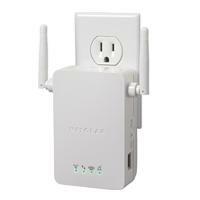 The Netgear WN3000RP is a WiFi repeater. Strategically located between your traditional WiFi hub or router and the distant location from which you’d like to be able to access your WiFi network and haven’t got a prayer of doing so, it will connect to your existing network and clone it, creating a new network with a bigger and more conveniently-situated footprint. The first suggestion that the Netgear WN3000RP won’t entail a lot of head bashing to bring on line can be found immediately inside its packaging. The device itself consists of a plastic box with a electric plug protruding from its back and two antennae sprouting from its case. Plug it into a suitably-located electric outlet, wait about two minutes for it to boot up and it will be working. The second suggestion will be found in its diminutive printed instruction booklet, which runs for all of sixteen pages. Its author doesn’t appear to have been unusually cheap with its allotment of paper in this regard – the box is so simple as to require no further assistance. A more complete downloadable PDF manual is available at the Netgear web page, but only the most adventurous users of this device are likely to need it. Once the Netgear WN3000RP is showing lots of green lights, you can log into it by connecting to its default SSID with whatever WiFi manager your computer or tablet uses, and create a dedicated extended network. By default, it will generate the SSID for one by appending “_EXT” to your existing network’s SSID. As such, if your existing network is called MyNetwork, your new, larger network will be called MyNetwork_EXT. You can, of course, call it anything you like. The first time you log into the Netgear WN3000RP with a web browser, it will run an internal setup wizard to assist you in configuring it. The wizard is expertly designed and simple enough for even government employees to master successfully. When it’s waved its magic wand for the final time, the WN3000RP will be ready to rock. There are some advanced features of the Netgear WN3000RP’s interface that you might want to get involved with once everyone stops remarking on all the bars that get lit up in the status areas of your wireless devices. The most important of these will be its access control screen. Because the range of this thing is so impressive, it’s likely to make your new network accessible to nearby cybercretins and other persons of low forehead who will be disposed to trying to hack into it and steal your bandwidth… or download content that may bring you to the attention of evil record company lawyers. The Access Control screen of the Netgear WN3000RP will let you permit only selected devices to connect with your network. You can create an entry for each of your toys, and effectively exclude all the other toys on Earth. Once it’s been configured, the Netgear WN3000RP is imminently forgettable. Ours hasn’t crashed, hiccuped or hurled itself into space since it came on line. It’s about as complex to use as a toaster. As an aside, our WN3000RP’s firmware was in need of an update when the device was installed. Downloading and installing the upgrade made connections to our network still more reliable, and simplified the user interface. One of the surprising aspects of the WN3000RP is its miserly consumption of power. Our electric bills consist primarily of tax grabs, and we’ve learned to plug everything that shows up into a power meter before it goes on line, to forestall any further sticker shocks from our local power company. The range extender sucked back all of two watts when it was running, a number than never appeared to change. While unquestionably a one-trick pony, the trick performed by this device is worthy of applause. It will overcome a world of pain in making disparate WiFi devices communicate, speed up whatever you’re trying to access over your network – web browsing over a tablet has never been more impressive – and do it all with scant minutes of setting up and reading the instructions.